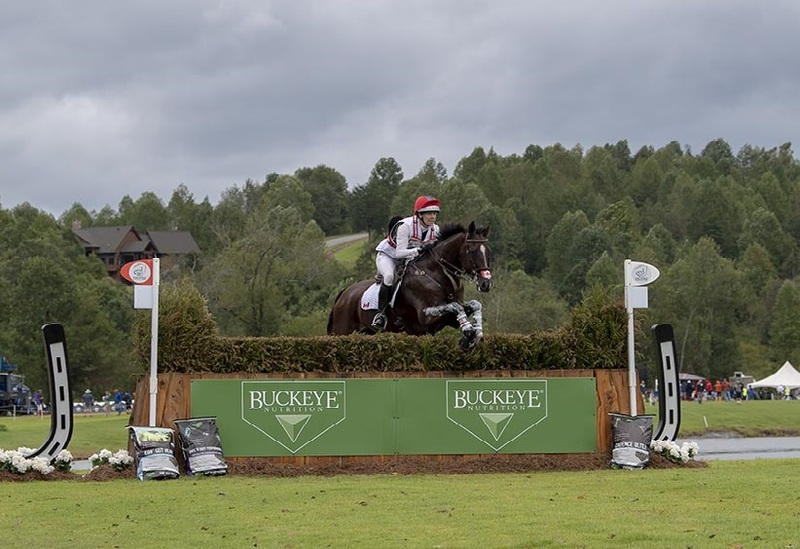 The exciting cross-country phase took place at WEG Tryon, with an accelerated start order that set out on a three-minute schedule instead of four in an effort to conclude the competition before tropical storm Florence moved into the area in the late afternoon. Capt. Mark Phillips of Great Britain set a track where the uniquely designed and beautifully constructed fences were the stars ‒a course featuring 26 fences, 50 jumping efforts, and plenty of options. For the Canadian Team, Colleen Loach was first out of the gate and had a magnificent round, incurring just 10 time faults aboard Qorry Blue d’Argouges, Peter Barry’s grey 14-year-old Selle Francais gelding. “It felt great; it rode like it walked,” said Loach. “My horse jumped great and I had lots of steam left at the end. She commented on the last-minute decision the ground jury had made to remove two fences at the top of the long climb to the finish. “They were worried about the hill being too hard on the horses if it was a bit hotter and also if they got a lot of rain and the going got a little bit deep. My horse had so much run left, I don’t think it would have made a difference. As a team, Canada sits in 11th place; Great Britain, France and Ireland dominate the top of the leaderboard with mere points separating them. Directly behind them is the Japanese Team, who managed to sneak past eventing powerhouses Australia and Germany. The Norwegian horse Euforian, ridden by Heidi Bratlie Larsen as an individual, was pulled up by the Ground Jury after fence 21 and was taken by horse ambulance to the onsite Veterinary Treatment Center. The 13-year-old gelding hd been diagnosed with soft tissue injury and is being cared for in the Treatment Center onsite. Box Qutie, the Swedish horse that pulled up lame at the finish of the cross-country, was transferred by horse ambulance to the Tryon Equine Hospital four kilometres from the venue for assessment. The 12-year-old mare, ridden by Anna Freskgård on the Swedish team at last year’s FEI European Eventing Championships in Strzegom (POL), has been diagnosed with soft tissue injury and is being treated at Tryon Equine Hospital.